And we’ll take six, please. 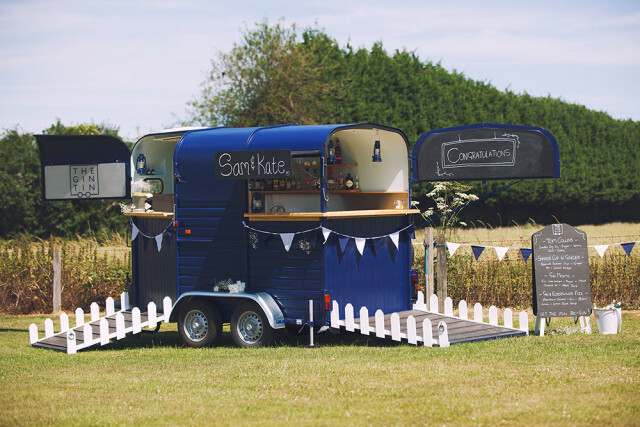 This might be the most adorable and clever up-cycling of an old horse trailer we’ve ever seen. We’ve discovered the one thing that every horse show, equestrian event, horse-themed wedding or general barn get-together needs to make the day complete: introducing the Gin Tin, the former horse trailer-turned-mobile gin bar. The father-daughter team of John and Anna Shanks and family friend Chloe Davies of London needed just eight weeks to literally build their new start-up: they took an old Rice Beaufort two-horse box (purchased used from an ad on Horse and Hound) and made some modifications — at their most basic a new paint job and most complex the installation of countertops and shelving. One liquor license later, the Gin Tin was ready to roll, serving up gin cocktails and other drinks at events and gatherings. Despite the modifications, the Gin Tin is still light enough to be towed easily: “We currently use a car to tow the horse box, but one day we hope to upgrade to a large van as we have a lot of equipment and stock to carry – more than you can imagine!” states Gin Tin mastermind Anna Shanks. We’ll be ready for you when you do, Anna, John and Chloe! Until then, stay fabulous. Learn more about the Gin Tin online including a great blog, or follow on Facebook and Instagram. Go Gin Tin! And go riding!